Baytown, Texas – The NHRA traveling road show had a short turn around this week. After completing the Denso Four-Wide Nationals in Las Vegas on Sunday, the NHRA team headed east to Houston. 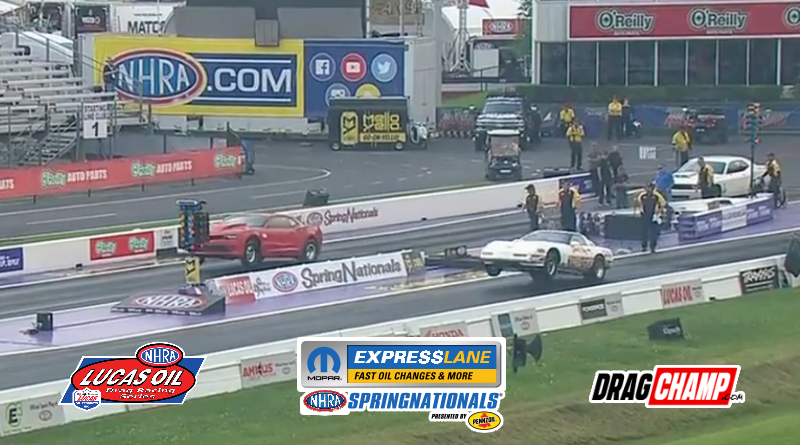 On tap this week is the Mopar Express Lane Spring Nationals presented by Pennzoil at Houston Raceway Park. A large number of sportsman racers spent last weekend at the Division 4 Lucas Oil double-header at the Texas Motorplex. The race ended up being a marathon after weather delays pushed Race #2 to Monday. As usual, the Spring Nationals will have a light field of sportsman racers this week. Only 200 competitors are entered and Stock Eliminator is the only class that reached it’s quota. The Spring Nationals has a history of weather issues which contributes to the low car count. In addition, as nice as Houston Raceway Park is, there is limited asphalt parking which forces the sportsman racers to park in the grass. The dirt and dust are annoying when it doesn’t rain but the mud is unbearable when it does rain, which it normally does. It’s a shame the NHRA can’t find a better time of year for this event, October would be nice, as HRP is a great facility and deserves a better slot in the schedule. For the second week in a row, the NHRA will use the three-day event schedule. Sportsman racers will take qualifying and time trial shots on Friday morning. There are only five sportsman classes competing at the Spring Nationals including: Super Stock, Stock, Super Comp, Super Gas, and Top Dragster. There are a total of 202 racers entered for the event. Super Comp and Super Gas racers will get two time trials on Friday while Super Stock will have two qualifying attempts. Stock Eliminator competitors will have one qualifying attempt before moving into class eliminations. And finally, Top Dragster racers will make three qualifying passes on Friday. Saturday is race day as the sportsman classes are scheduled for four rounds of eliminations in the morning. This could change as the forecast is calling for severe storms on Saturday. If the current schedule sticks, Sunday’s action will include the semifinal and final rounds for sportsman racers. With each NHRA national event DragChamp’s sportsman preview includes an overview of each class. In addition, we select the DragChamp Picks to win the race. Here are this week’s picks. Defending class champ Brenda Grubbs will be looking for a repeat performance from 2018. She’ll have stiff competition from the Cummings Motorsports team, Aaron Stanfield, Emmons Motorsports, and many more. Pete Peery – Made a run at the world championship last season, a win would kick start his season. Brett Candies – The Candies Family team has great equipment, Brett is a win waiting to happen. Jeff Hefler – The Pro 1 Safety products owner has visited the HRP winners circle many times. Mike McMahan leads the national standings and is traveling from Florida looking to pad his lead. He’ll have to contend with a tough crowd that includes last week’s Division 4 Lucas Oil winners Austin Williams & Jacob Pitt. Jeff Lopez – One of the toughest racers I know, he’s always in the mix at Houston. Austin Williams – Two-time world champ got it done last week, would love to start a championship run this week. Slate Cummings – It’s hard not to include “Baby Gap”. Slate is as good as they come and frequently finds the winners circle. Look for the Laris Motorsports Insurance team to make some noise this weekend. At least one team member has parked it in the winners circle at each of their first four events this season. They’ll be challenged by the Collier / Manpower race team, Chase-N-Dad Racing, Team Elrod, and many others this week. Koy Collier – Talented young gun won Super Gas last year, he’s just a good in Super Comp. Austin Williams – Almost doubled last weekend in Dallas, could ride momentum to a double this weekend. Chase Murray – The Lupe Tortilla entry would love to make some noise for the hometown crowd. Cole Cummings comes into the event atop the national standings by a large margin. Two Lucas Oil divisional wins, including one last week in Dallas, have put him in the championship hunt. Cole Cummings – Going to stick with a winner here. The Moser Engineering sponsored racer has been on fire. Val Harmon – Tough racer who’s already visited the HRP winners circle this year. Keith Raferty – Talented Top Sportsman driver who’s overdue for a win in Super Gas. The smallest sportsman field should still be one of the most entertaining to watch. Based on the entry list, there will be a dogfight for the number one spot. Ross Laris has been hot this season along with Aaron Stanfield. Aaron Stanfield – Super talented driver with great equipment and red hot recently. JR Baxter – Had a quiet year in 2018, I fully expect him to make up for it in 2019. That covers the NHRA Spring Nationals Sportsman Preview. Look for daily updates throughout the weekend on DragChamp.